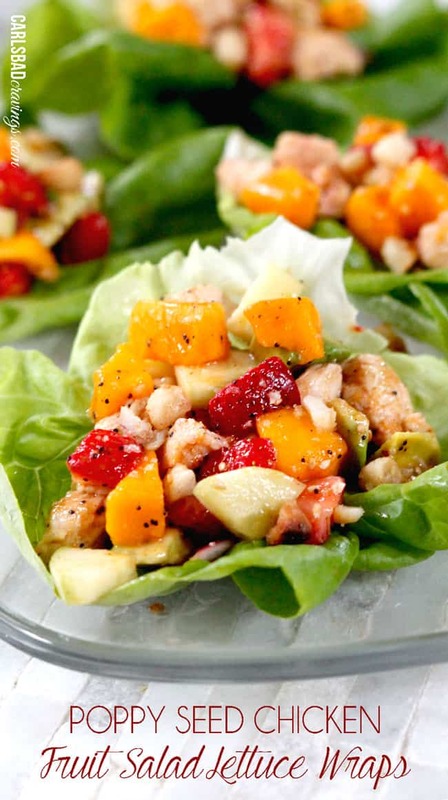 Chipotle Chicken Salad with Honey Lime Mango Dressing will have you actually craving salad! 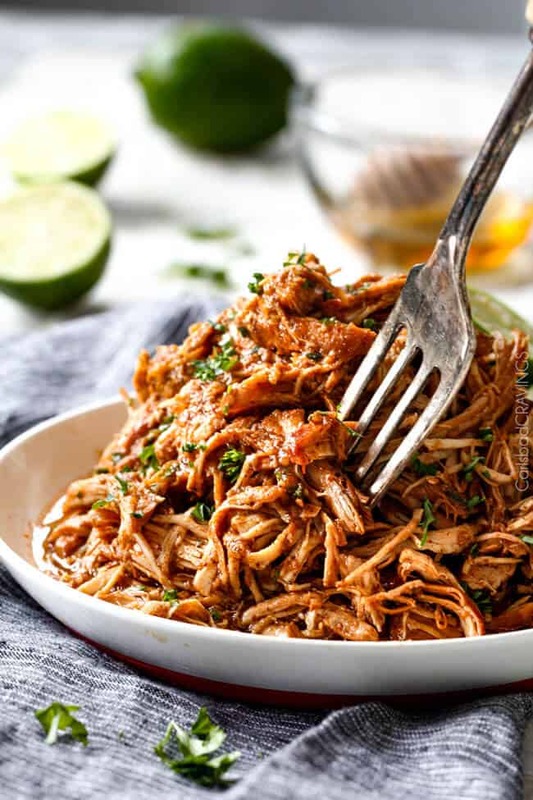 This Chipotle Chicken Salad is bursting with tender, juicy fiestalicious chicken, crunchy veggies, salty sunflower seeds and crispy tortilla strips all sprinkled with buttery Monterrey Jack Cheese and doused in sweet, tangy and refreshing Honey Lime Mango Dressing! 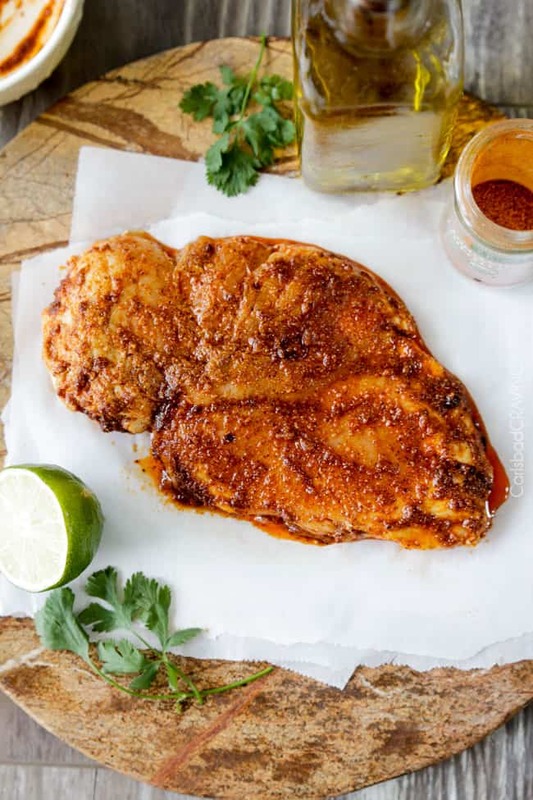 This Chipotle Chicken is bathed in a wet rub of olive oil and a splash of lime juice mixed with the aromatic Mexican spice blend of chipotle chili powder, chili powder, cumin, smoked paprika, garlic and onion powder. Depending on your time, you can cook the chicken right away after slathering it with the rub or wait 30 minutes or better yet, let it marinate a few hours. I’ve included both stovetop and grill directions, so no matter your time frame or preferred cooking method, this juicy, tender, chicken will create an explosion of yum in your mouth. 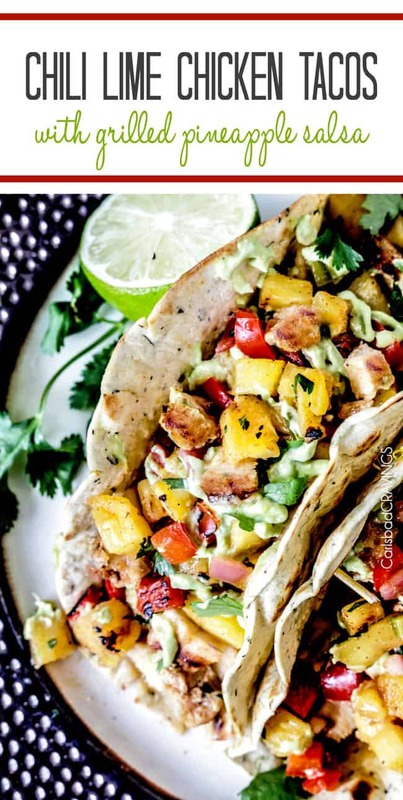 Looking For more recipes using Chipotle Chicken? 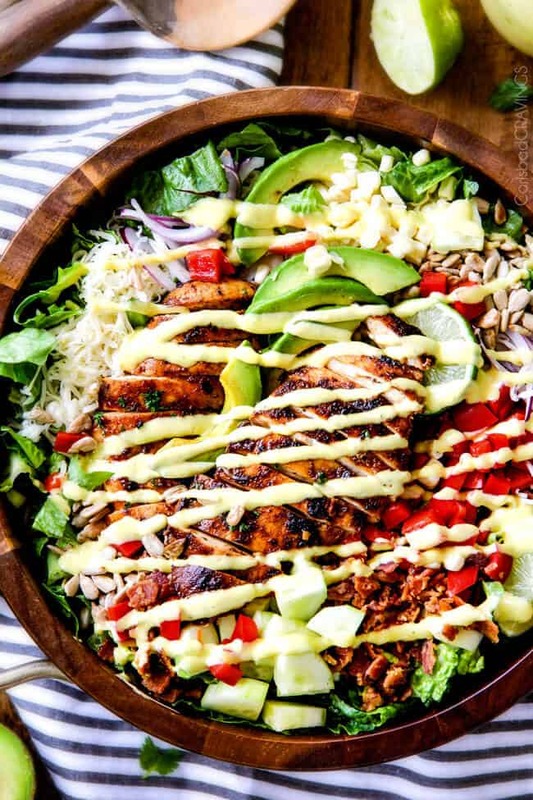 When I thought of what dressing would pair perfectly with the smoky heat of this Chipotle Chicken Salad , I instantly thought of refreshing, creamy mango. The sweetness of the mango enhanced with honey, balanced with tangy lime swirled with canola oil creates a match made in flavor, texture heaven. And if you are intimidated by cutting mangos – do’t be, just check out my How to Cut A Mango Post that teaches everything you could ever want to know about mangos! Drizzle this chilled creamy refreshing Honey Lime Mango Dressing all over your chopped lettuce, fresh sweet corn, juicy tomatoes, savory black beans, crunchy cucumbers, crisp red bell peppers, tangy onions, salty sunflower seeds, creamy Monterrey Jack cheese and crispy tortilla strips…I think I got everything….and then make your mind, body and soul very, very happy bite after bite. Until then. I hope you enjoyed the introduction to this Chipotle Chicken Salad. Happy cravings. 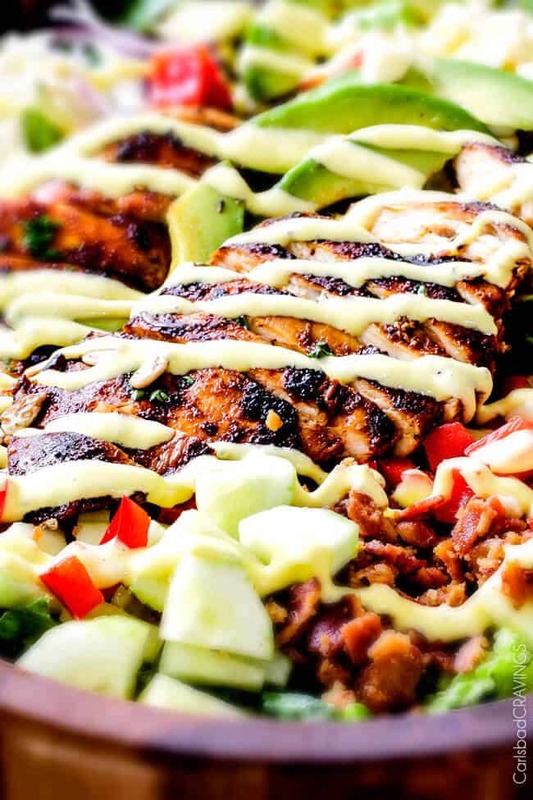 Want to try this Chipotle Chicken Salad Recipe with Honey Lime Mango Dressing? Pin it to your SALAD or MEXICAN or GRILL Board to SAVE for later! 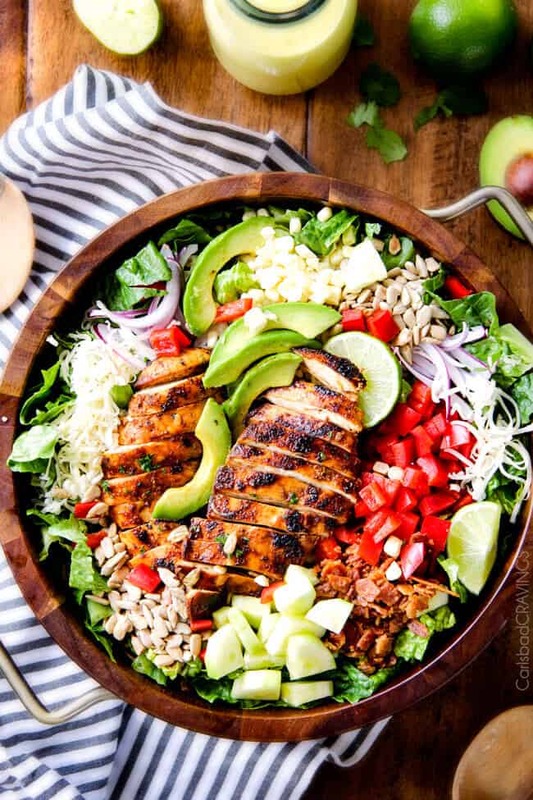 This Chipotle Chicken Salad will have you actually craving salad! 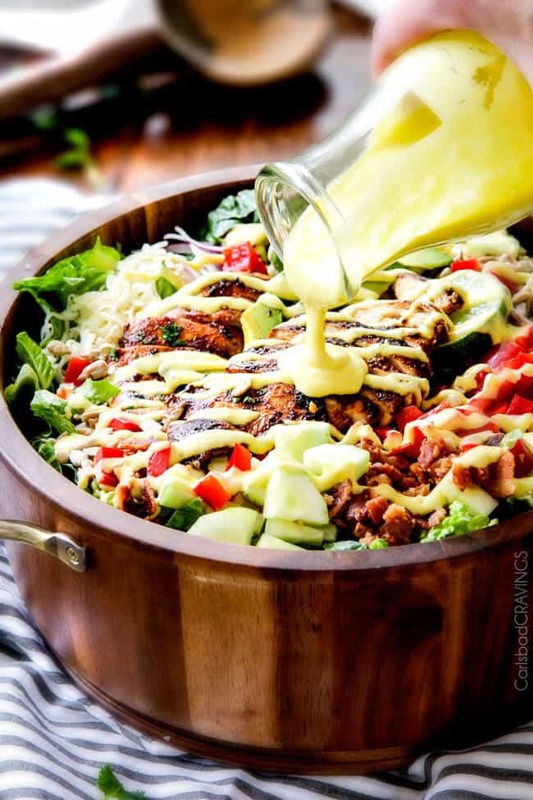 This Chipotle Chicken Salad is bursting with tender, juicy fiestalicious chicken, crunchy veggies, salty sunflower seeds and crispy tortilla strips all sprinkled with buttery Monterrey Jack Cheese and doused in sweet, tangy and refreshing Honey Lime Mango Dressing! Honey Mango Dressing: Add all of the ingredients to your blender except the canola oil and chop then puree until smooth. Blend in canola oil. Taste and add additional jalapeno for spicier, honey for sweeter, and/or lime juice for tangier. Chill. Prepare Chipotle Chicken according to directions. Chop or thinly slice cooked chicken. 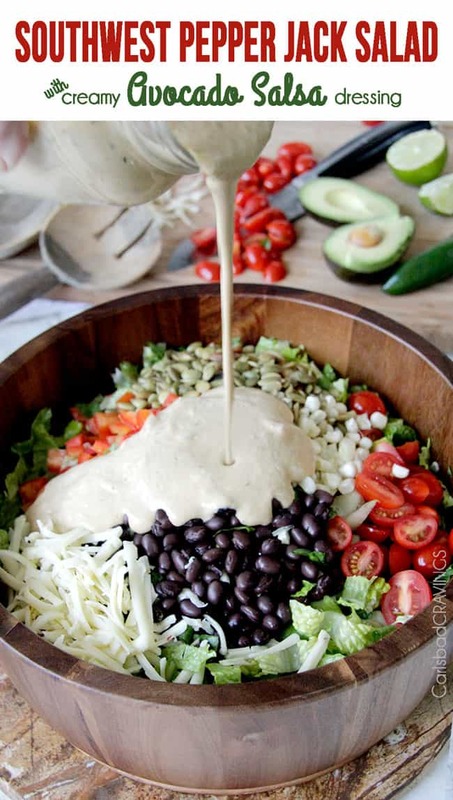 To assemble, toss the chicken, Salad Ingredients, cheese and sunflower seed together in a large bowl. Garnish individual servings with tortilla strips and drizzle with dressing. *for a creamier dressing add 1-2 tablespoons mayonnaise if desired. This chicken salad is my kind of salad! It looks amazing!! Love the aromatic Mexican spice blend you used for the chicken. Thank you so much Amy for your kind comment! I hope you can try it soon and love it! There’s a mango allergy in my family, do you think the dressing would work with pineapple instead? Hi Jessica! Yes I think pineapple would be delicious but I would increase the honey by a tablespoon or so to taste as pineapple can be tangier than mango. Enjoy! Hi Jen! With all the Caramel Slice (courtesy of Nagi) I’ve been eating, this is just what I need! Chipotle is one of my favorite seasoning and we have fresh corn and tomatoes here and romaine lettuce from our garden, so I’m in business! caramel sauce, mmmmmm! It sounds like you have a delicious week lined up with all that caramel sauce and my ribs and mac & cheese – wahoo! SO happy that those are on the menu tomorrow! 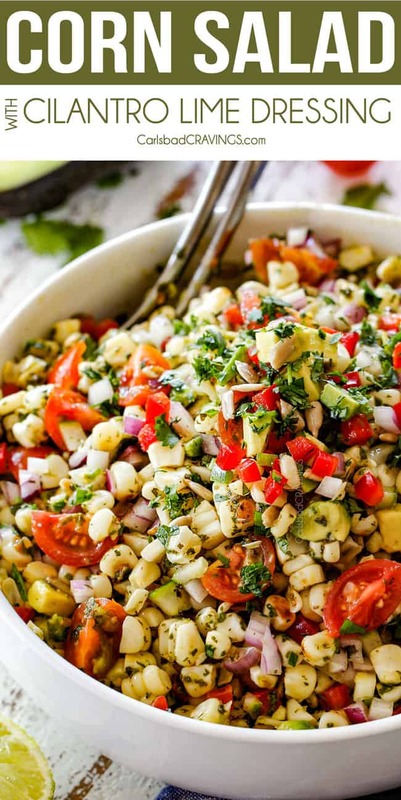 Yes, this salad will be perfect after that indulgence and how wonderful you have so many of the ingredients straight from your garden – amazing and so extra yummy! Sounds wonderful! I’m going to run out tomorrow to make sure I have all the ingredients! I could pinkie swear that I see avocado in your picture. Am I right? If I’m not, that’s fine, but I think that some avocado would be a real asset. Yummy creamy! You are so right Heather, there is definitely avocado, I will add it to the ingredient list! sorry about that, I hope you grabbed avocado when you were out and that you enjoy this salad! This is a gorgeous summer salad. The dressing sound delicious! You are so nice Alaina, thank you! Doesn’t get much better than creamy mango dressing in my book! Hope you love this salad! My husband and I ate this for dinner tonight, and we loved it! The salad is so pretty with all the different colors. Lots of different textures and flavors. The chicken and dressing were so flavorful. The dressing was sweet and spicy. I just loved how it all went together. Thanks for another great salad recipe! Awesome Kristin, thank you so so much! I love how you appreciate how everything comes together – that really is the key to a winning salad – so happy it was a hit at your house! I made this and it is probably the best salad I’ve ever made! The chicken was so flavorful and had just enough kick. The dressing is lite and so fresh tasting. I left out the tomatoes because this is a very time consuming meal to make and I didn’t think anyone would miss them or notice, which they didn’t. I also didn’t put the seeds or cheese. Delish!!!!!! YAY! Thank you so much for the ultimate compliment Renee! So happy you loved it so much! Hi there – could I SUV avocado oil or olive oil instead of canola? Thanks! O M to the G!!! This was the best salad ever! The dressing is absolutely delicious! My family loved it. Thank You for the AWESOME salad recipe. You are so welcome Jo Ann! I am thrilled it was a hit with the entire family! Thank you for taking the time to comment! I just made this for dinner and wow, the dressing is fantastic! I don’t know how you consistently have such great recipes but I really appreciate it. And I appreciate you taking the time to comment! I love hearing when people are enjoying my recipes – especially ones that don’t have a lot of comments! Thank you so much Lora! I haven’t made this yet but I definitely need to have that great wooden bowl to complete the presentation. Can you tell me where I can get one of those bowls? Thanks! Hi Joe, the bowl is from Target – love Target! I got it a while ago so I’m not sure it will still be there. Enjoy! I just have to say that this salad recipe changed my entire view on salads. I have literally never actually enjoyed a salad, just tolerated eating them. This dressing with the chipotle chicken changed my entire salad perception!! I meal prep it almost every week now to take for lunch. You totally made my day Megan, thank you! 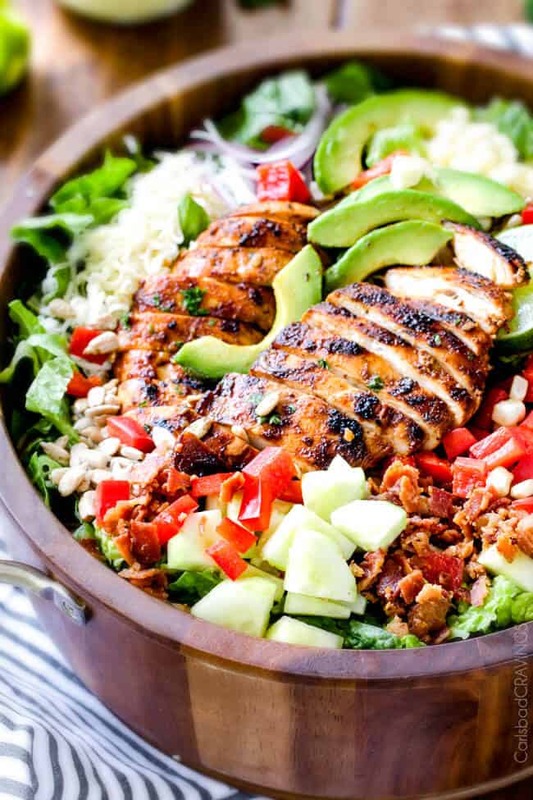 I am honored this Chipotle Chicken Salad has changed your whole view of salads! I hope you find more salads to love here!